In a Nutshell: Finding the most effective ways to conduct marketing campaigns has long been a source of stress among financial service providers. Getting customers to read direct mailers or open email promotions is a science that seems to change every few hours. 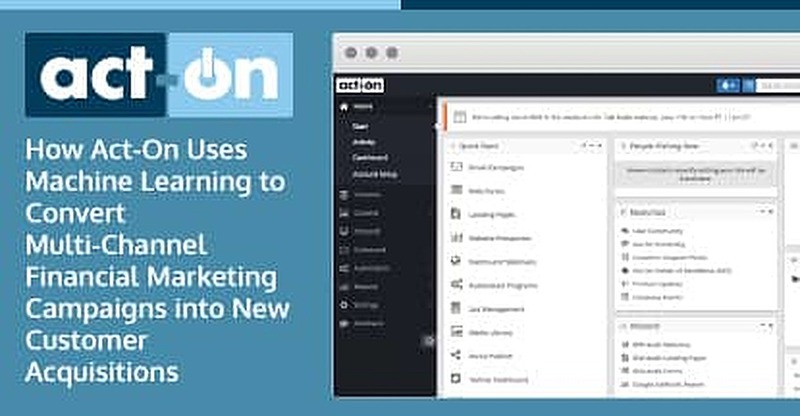 Act-On has turned that science into an art form with an automated marketing system that uses machine learning to engage customers at the optimum times with just the right message to create conversions. Several financial clients have seen upwards of 50% open rates on mass-email campaigns using Act-On, with greater sales numbers and increases in new customer acquisitions. Act-On’s goal is to give small marketing teams the same advantages as large firms with bigger budgets. Marketing a financial business is always a tricky proposition. Email campaigns can often fail if not properly executed. Social media is still an area where many financial firms struggle to find a voice. And direct mailers are expensive and typically pack more landfills than branch offices. The evolution of digital marketing tools over the last five years is a boon for the industry, but it also requires marketers to remain nimble in ever-changing times. For financial firms with smaller promotional teams, a knowledgeable partner can mean the difference between thousands of trashed emails and hundreds of new customers. Act-On is a leader in digital marketing technology after more than a decade of guiding its clients from a mostly automated marketing society into a new age of adaptive marketing, where machine learning makes campaigns even more targeted than they were before. Act-On’s strategies have proven results for financial clients. Washington DC-based Interior Federal Credit Union’s multiple campaigns yielded a 2.79% direct response, resulting in more than $1.2 million in new balances, as well as a 20.32% percent indirect response that prompted more than $6.6 million in new balances. Clients leverage their partnerships with Act-On to create dynamic landing pages for email campaigns that result in higher conversions. After conversions turn into new customers, Act-On continues to learn to help expand the engagement opportunities between the financial firm and the consumer. This form of marketing automation is changing the landscape of how financial institutions are engaging with their customers. Act-On refers to its efforts as nurturing campaigns and uses each outlet in a multi-channel outreach platform to maximize its chances of engaging each target consumer at just the right time of day and with an appropriate message based on previous interactions with the company. Machine learning and automation are major buzzwords in the financial industry, but they aren’t often associated with marketing. Act-On aims to change that with its adaptive marketing strategies that have helped clients like Oklahoma’s Truity Credit Union achieve open rates on email campaigns that have reached as high as 54%. 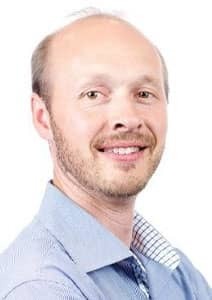 Adam Mertz is the Marketing Leader at Act-On. Mertz refers to these interactions as breadcrumbs, which the Act-On system collects and puts to good use — similar to a pigeon feeding on crumbs. The system learns the typical time of day each individual user interacts with the company through social media or email and targets those times for future interactions. Campaigns targeting thousands of customers send emails at dozens of different times throughout the day, with each email optimized for the end recipient. To optimize the proper saturation of a campaign, Act-On uses a full data warehouse that looks at every behavior of individual users. The company architected its system to tap into all of that data and leverage it to maximize future campaign conversion rates. Sending information on a firm’s latest promotion can be as easy as clicking the Send button on a mass email. Getting your targeted customers to actually open the email and consider the benefits of the offer requires far more thought and planning. For Maryland’s Tower Federal Credit Union, the results were clear from the beginning. In the institution’s first auto lending campaign with Act-On, 169,000 emails sent to members resulted in a 50% open rate, which was twice as high as its prior auto lending campaigns. But Act-On doesn’t stop when a consumer opens an email. The program continues to learn by creating a series of reactions based on customer engagement. If a customer doesn’t open the email, a curated follow-up email will be sent several days later. When a consumer opens an email, multiple different responses can occur based on previous interactions with the customer. Email campaigns can also include multiple title headers to be sent out in an even distribution. After Act-On acquires a proper sample size, emails will default to whichever header receives the best response. “Those are the types of things that are woven into our system that help marketers market smarter and get higher conversion rates,” Mertz said. And several months later, when it’s time for the next campaign, Act-On will still remember engagement information from previous campaigns. “The program reacts based on how the customer is engaging during a specific nurture campaign, but it also remembers those engagements in the future when you’re sending out messages for other products or campaigns,” Mertz said. Act-On’s goal is to give small marketing teams the same edge larger enterprises have when it comes time to promote a new campaign. Mertz said those goals are especially important to financial institutions. Act-On helped the American Endowment Foundation more than double the number of leads generated from previous campaigns while also enabling the foundation to implement new campaigns more than four times faster. With each campaign, Act-On helps its clients learn more about their customers and creates new ways to engage them through multiple channels. “We’re not trying to make it so that it’s just better reporting, but that the system is actually providing recommendations and analyzing that data for the marketers,” Mertz said. So for each new breadcrumb collected, Act-On continues to grow alongside its clients with a push toward a new age of marketing that will read and react to every engagement in a unique way.